Last year The New Stack did its first reader survey. We used the data to define our editorial calendar and depth of coverage for the year. Today we are launching a new reader survey to define the topics and formats we cover for the next year and would really love to have your help. We have exciting ideas for 2019. We want to publish more technology demos next year, livestream at various events and talk with the people making things at the new edges, be they in a serverless implementation or some combination of new distributed architecture that provides more than standard multi-tenant environments. Last year’s reader survey showed that people want a more in-depth technical perspective which we have continued to develop and is reflected in the growth and health of The New Stack platform in 2018. We plan to continue this deep dive into technologies in the new year as well. Open source is a narrative that threads throughout our coverage and will continue to be how we better get to know developers who are building and using the technologies we explain and analyze. I can only expect open source technologies will have a social and economic impact as much as a technological one, which we see now on a constant basis through developer communities, the organizations behind them and the market forces that shape the narrative. Businesses run on software and software is increasingly open source. The 2018 editorial calendar followed the results of last year’s editorial survey. We based what you saw on The New Stack this past year from the feedback given by developers, software engineers, operations teams and the many who see themselves as DevOps professionals. We placed an emphasis on developing our coverage and asking for contributed posts that fit into the theme we were following. Those feature series culminated in the research and reporting that appeared in our ebooks. Our Guide to Cloud Native Microservices and our latest ebook about serverless technologies well represent the editorial operations model we followed in the past year. What we really learned through all of this is the value of editorial operations. This allows us to better structure narratives that are driven by the people who make up the developer teams and who follow workflows that fit with developer tools, platforms and technologies. We will continue to seek out and provide our platform as a place to share the voices of the people at the intersections of technology and cultural practices. This intersection is at the core of how developers and operations teams build, manage and deploy at scale. Representative of our reader interests is an upcoming ebook about DevOps that will take a close look at how the practice is changing with ever more automation. This enables teams to use resources more efficiently, depending on the workload that is managed. The DevOps article series, which concludes in December, will lead us into a focus on machine learning and artificial intelligence in the first quarter of 2019. We will research and discuss this nascent technology from the perspective of application development practices and the intersection with data architectures. Our coverage has its roots in container technologies. The container technology and orchestration story is one starting to have its imprint on the development of data architectures. How algorithms are defined and developed will serve as themes for us in the context of machine learning and artificial intelligence. Suffice it to say, that there will be lots to explain and analyze on The New Stack over the course of the next year. Our publishing model is helping us define what we are calling editorial operations or “EdOps,” for short. It’s built on a foundation that states we operate entirely on a production schedule that is driven by our editorial calendar. Inspired by GitOps and workflow approaches, our news and overall editorial operation are driven by processes that we are working on improving all the time. It’s a people driven process that allows us to use our production deadlines to better develop narratives that follow our editorial calendar. Our experiences in developing an editorial operation will be shared and discussed with sponsors and people interested in the topic. Our EdOps journey is underway — our reader survey is a big part of shaping how we define our themes and will drive how we execute on our work and improve upon this craft we love so much. On a last note, The New Stack is a project that comes from a love for developing ways to tell stories effectively and then sharing it with others. Thank you to our readers and listeners, and to our sponsors for making that possible. Your support means that we can continue produce works across multiple mediums and share what we learn about at scale development and deployment along the way. Take care and hope to see you soon out on the road. 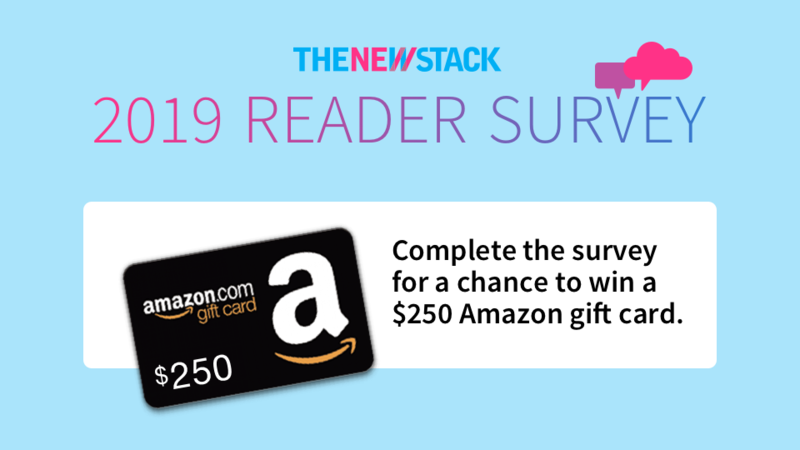 In concert with our 2019 reader survey, The New Stack is giving away a $250 Amazon gift card. Anyone may enter the sweepstakes starting on Tuesday, Nov. 6, 2018, by providing their name and email address at the end of the survey. If you do not wish to complete the survey, you may enter the drawing here. The New Stack never has and never will share your personal information and will only use your email for the purposes of contacting the winner. Limit one entry per individual. Likelihood of winning will depend on the total number of entrants, estimated to be in the 1/500 to 1/1,000 range. The New Stack will choose a winner after the close of the survey, no later than Dec. 31, 2018, through a random drawing of all entries. The winner will be notified via the email address they provide. Address questions about the survey or sweepstakes to research@thenewstack.io. The post Take The New Stack Annual Reader Survey — Your Response Matters appeared first on The New Stack.